Designed by architect Eben E. Roberts. 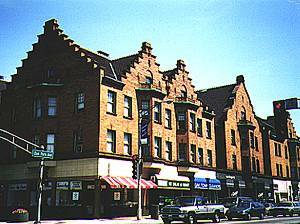 The building on the right (on the southeast corner of Lake Street & Oak Park Avenue) is the only major commercial structure ever erected in Oak Park in the Prairie style. Surely modeled after the buildings of Louis Sullivan and his student, Frank Lloyd Wright, the flat brick walls articulated by brick piers, the arches continuing the theme at the top of the walls, and the hip roofs that cover the entire building all reflect the Prairie idiom. 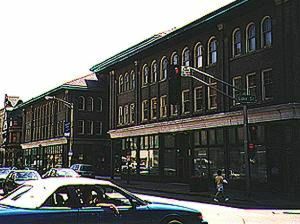 This is called the "Second Scoville Building," because across the street (at left above) is the "First Scoville Building" - both were commisioned by Oak Park financier and philanthropist Charles B. Scoville. The Blading Tour now continues on its last segment west along Lake Street; but first, we must enjoy the excellent Blading through Scoville Park, starting with a look at the "Horse Show Fountain" at the entrance to the park.